While there are parents who seem to be skeptical about the idea of homeschooling their children, nowadays, more and more are open to this concept of education. Home learning or homeschooling does away with the structured method like that of a traditional school in teaching a child. Thorough consideration to the practicality of homeschooling takes time. Important points should be discussed by the parents with their children, and possibly with an experienced homeschooling parent. Aspects that would affect the decision-making are: finances; the huge local homeschooling laws; readiness of the parent and child in taking the program; and, the child’s desire to participate in certain activities. The idea of home learning your children is appealing, but you have to know why it is important to do so instead of enrolling them in a regular school. Because once you are into the program, you will have to stick to it to make it work. Your children will learn better if you set up a schedule which should include all activities, like – getting up from bed, eating, naps, baths, other activities and bedtime, not just the study hours. This consistent routine sets clear expectations for your children, giving them a degree of self-confidence and making them prepared and keen to learn during scheduled school hours. There are institutions offering homeschooling programs, usually they have websites where you can get their contacts for your inquiries. They will give you information regarding the programs they offer, the system and other procedures. Also, what existing laws govern such programs. Books and other materials are usually supplied by these institutions. 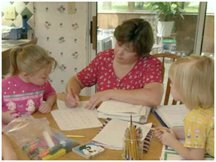 Homeschooling parents in the area or the local homeschooling organization assist other parents, especially those who are new. Parents who have home learning tried and tested will certainly say that it is rewarding, both for them and their children. Even though the adjustment as first wasn’t easy. What makes child home learning an interesting way for gaining education? The primary reason perhaps is that families can create tighter family bonds, both between siblings and between children and parents. Another reason, is the flexibility to adjust your child’s lessons to his specific needs, learning style, personality and interests. It allows you to take lessons anywhere, teaching children about the world outside their own four walls. In other words you can make learning far more motivational and creative. Your children can learn others things they are interested in like, piano lessons, ballets lessons and the like. On the other hand, homeschooling can be a bit costly. If both parents are working, you have to decide who will have to stay home during the school hours they set for the teaching. With your role now as the new teacher you question your capability to teach, and your children’s progress all throughout. Lest your children are interested in sports, homeschooling may disqualify him for sports scholarships, since some schools don’t accept homeschooled children. If you have decided to homeschool your children, you have to stand by it. Unless, you want to go through a lot of trouble of switching back to regular schooling.